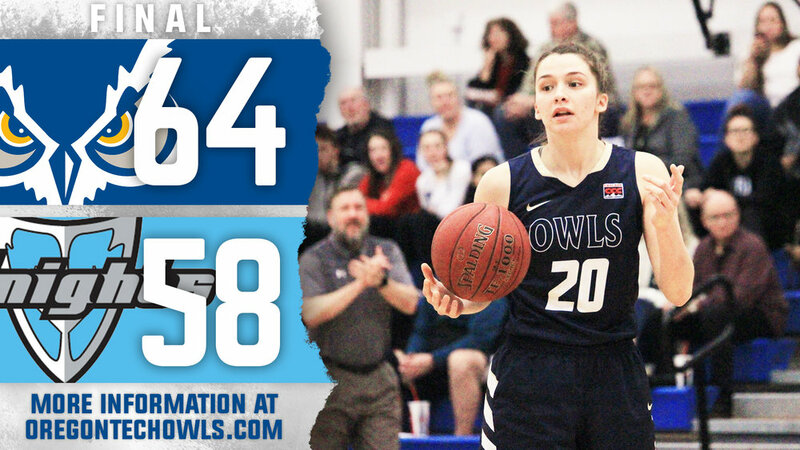 PORTLAND, Ore.- Junior Mikayla Shumaker scored a career high 20 points and added 10 rebounds for her double-double to lead Oregon Tech (16-8, 9-5 CCC) to a 64-58 Cascade Conference win over Warner Pacific University (10-13, 6-7 CCC) Friday night at Bart Valentine Court. The Lady Owls took an early 11-4 lead before the Knights went on a 10-3 run to tie the game at 14-14 and the end of the first quarter. OIT out-scored WPU in the second stanza 14-9 to take a 28-23 lead into the halftime break. Tech took its largest lead of the game at 41-31 with 3:18 to play in the 3rd quarter on a Bailey Nelson layup. Oregon Tech sealed the win in the final stanza making 17 of 20 free-throws as they came away with the 64-58 win. Tech finished the night 25 of 35 at the foul line while WPU was just 10 of 16. Nelson joined Shumaker as the only other Owl in double-figures in scoring with 10 points. Bailey Allen led the Knights with 11 points in the loss. Oregon Tech will travel across town to play at Multnomah University Saturday night at 5:30 pm.